There are some tall girls who slouch, don't stand straight up and want to look smaller. 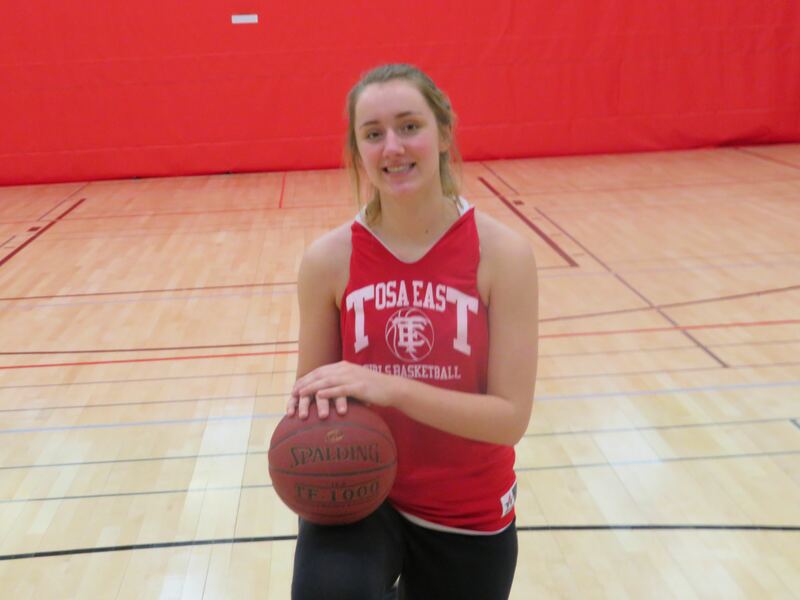 Wauwatosa East senior captain Johanna Taylor is not one of them. 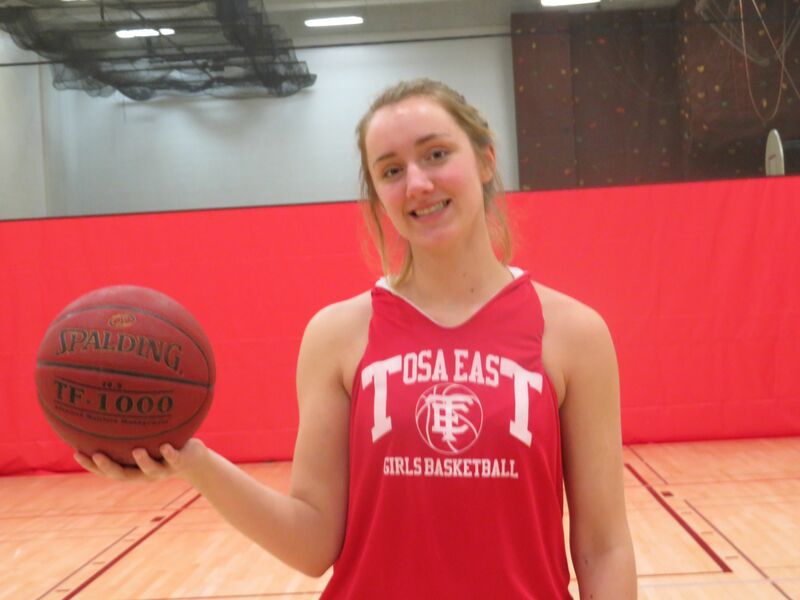 Taylor, who along with sensational sophomore Brooklyn Blackburn, are two of the major reasons Tosa East has put together two straight winning seasons. Taylor is the Red Raiders' center and she stands 6-feet, 2 inches tall, and is second on the team to Blackburn in points (10 points a game) and rebounds (7 a game). But the reason she is affectionately known as "Big Mama" by her teammates is because of the way she has their backs on defense, averaging almost 3 blocks per game. "They use the term 'Big Mama,'" Johanna said of her teammates. "I'm the 'Big Mama' on the team. Everyone calls me that. I'm 'The Queen.' It's because I have to always guard the other 'Big Mama's.' I'm the taller kind and there's stockier (girls). "I wish I was more 'buff.' Just stronger. Sometimes it gets hard with how big other girls can be. But with the strength that I have right now, it's really nice, I can just push people and get in there. But I wish I could be stronger because some girls are. Taylor talked about her role with the Red Raiders. "Being the big man. Being strong. Being scary on defense," she said. "A lot of my teammates get scared in practice because they know I'm in the middle. I'm always blocking them, I guess. I get rebounds, get blocks, just do the dirty work inside. I definitely like being inside." And Johanna, whose dad Wade is 6-4 and mom Laura is 5-7, has always liked being tall. Besides her sister Lydia playing for the girls before her, her brother Caleb played for Tim Arndorfer's boys team. "I remember being measured on the wall and I was the first person to get to the 5-feet mark. That's how I remember how tall I was back then," she recalled. In the sixth and seventh grade I remember having a bunch of back pain and my mom said 'You're growing.' I kind of looked forward to it. I like being tall." Johanna talked about learning to adjust to her longer length. "I think I've always struggled. I've always been a slower person," she said. "I tried to keep up with how fast I was growing. I don't think I've ever gotten used to it." Tosa East coach Rob Hamill, who also coached Lydia, first saw Johanna in the 7th grade with Longfellow Middle School. "She was pretty raw," he said. "It was clear she was going to have some size and if she wanted to be a basketball player it could work out. But it was going to take a lot of work. "In her junior year I was fully confident in her to be an impact player at the varsity level. I really was." Hamill was pleased with her improvement through her career. "Every year there's been progress - every year. Her footwork and determination have been noticeablely different this year. Her shot has developed every year as well. This year it's really coming off her hand. She has really good mechanics." When asked about her strong points, Hamill was quick to rattle them off. "Using her size inside. Her footwork has given her an advantage she didn't have last year," he said. "She is really concentrating on that stuff. She's been blocking shots more than before. Her anticipation of what her adversary's doing has come a long way." Taylor almost mirrored her coach's thoughts on her strength. "I use my length very well," she said. "In blocking I try not to use my body. Just try to stretch as far as I can. Anything I can get. That's what I try to do. "My footwork is also a strength because in previous years I was too timid and I didn't know how to use my feet in posting to shoot. I've been able to get around people now, use my quickness." As for getting better Hamill didn't see anything major for Johanna to work on. "She just needs to continue to work on what she has been contributing," he said. "I do wish with she would go to her dominate hand more. She goes to her left a lot." Taylor did bring up something else she needs to work on. "I need to work on my speed. I'm not as fast as I could be," she said. "I need to be more confident with dribbling. Not in the post, but if I'm around the 3-point line. I can take a drive. I need to become more confident." Taylor, who also plays volleyball, said the Red Raiders work on speed drills on 'Workout Wednesdays' and she hopes she continues to improve. One thing both Hamill and Taylor agreed on is her shooting 3-pointers. "I don't shoot threes," Johanna laughed. "Coach has a green light and a red light and I'm a red light. I'll take shots outside when I'm open. I'm confident in the shots from about 15 feet - I'm not scared." Taylor is smart enough to let her teammates handle the threes and she has a part in that. "Defenses try to double-team me, collapse on me a lot," she said. "I think that having my height and having my strength, really opens up the 3-point line for everyone else. I like getting assists. I think I like getting assists more than scoring." Taylor worked in the paint by herself last year, but this year has more help from Blackburn and Bueckers, who is also an outstanding soccer athlete. "Last year I handled it a lot, but this year with Brooklyn ('She's an animal'), it's kind of taken the load off," she said. "Sometimes we fight for rebounds. Sometimes Liz (Bueckers) helps out. She can jump real high." Taylor feels this season's team is unselfish. "We like to pass the ball. This year we're a lot more unselfish," she said. "We'll look for the open person. Sometimes it works against us, because we need to be selfish where we have strengths. "We work really well together. This year we're really good friends. We play basketball and not worry about scoring points. It's how everyone's grown up to be. We have a lot of juniors and they've been working together." Taylor talked about another important role that goes with being 'Big Mama' and senior captain - leadership. "I'm very approachable. They enjoy me so they listen to me," she said. "They see me as someone who has experience being on the varsity for three years. I know what I'm talking about. I know how to handle people who are down or something. "I've always been good at advice. They see me as someone who can help them. Seeing me a someone who can push them and keep everything together." Hamill is pleased with Taylor's leadership skills and he is happy she takes responsibility that goes with being a captain. "I couldn't ask for a better leader," he said, pointing out that senior Cora Bilitz and junior Liz Bueckers are also captains. "The two seniors are both good personality-wise. But Jo is where everything goes - her approach to the team, the emotions of the team. "She steps forward and talks about it. She is proactive rather than reactive. I can't imagine a better kid; mature, ready for the next step in life. Ready to leave high school in a positive way. "She's the type of kid that anyone would like to have as their own daughter. Strong head on her shoulders. Logical, solid, good sense of humor. Good person to be around." FAVORITE MOVIE: Interstellar, Outer Space Movies. WHAT DO YOU DO TO RELAX? Lay in bed and draw. FAVORITE SPORTS RIVALRY/ATHLETE: Wauwatosa West. MOST MEMORABLE SPORTS MOMENT: Stole the ball in the final seconds to beat Tosa West last year. WHAT WOULD YOU LIKE TO DO IN THE FUTURE? Attend University of Wisconsin - Madison. or UW-Whitewater. Major in Elementary Education or Art.